A recent national euphoria for Kalyppo fruit juice has increased momentum, with popular hiplife musician, King Jerry, releasing a brand new song ostensibly to support the new crave. The movement ‘Kalyppo Challenge’ started about a week ago when a social media user posted a photograph of flagbearer of the New Patriotic Party (NPP), Nana Akufo-Addo, sipping a paper pack of Kalyppo. 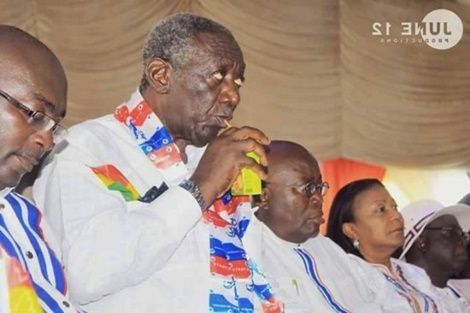 The post was deemed a subtle attempt to ridicule the NPP candidate and in response, several other persons on social media started to post selfies which captured them also sipping Kalyppo. Within days, the ‘Kalyppo Challenge’ had gone viral with a good number of big names, especially in the NPP, catching the fever. King Jerry, in his new fast-tempo highlife song, ‘Kalyppo’ tells the story of how he went on Facebook to find out what issue was trending only to find a photograph of Nana Akufo-Addo sipping Kalyppo. The song calls on everyone to join in the sipping of Kalyppo and that there is the need to “change” to Kalyppo. It talks about a sweet change and how the sweetness in the Kalyppo fruit juice can bring a sweet change to persons who taste it. Meanwhile, there have been reports of a shortage of the fruit drink in several parts of the country since the start of the ‘Kalyppo Challenge’.